If you think this blog is another message about women's body image, it's not. It's a literal title--actually about mirror choices. The new house is coming close to completion--though the pace has been even less than a snail's, as far as I am concerned. Because of my fatigue issues I can't hop from store to store to check things out. Even one trip to Lowe's is tiring because of all the stimulation of way too much stuff and walking long distances from one area to another on concrete. So, I ended up buying many things for the house online and every single one has been perfect. I love all my light fixtures. Here's the kitchen pendant fixtures with seeded glass globes. I bought cushions that will look amazing for the kitchen island chairs and a set of pottery canisters I absolutely adore. 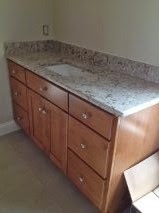 The white vanity with marble top that I bought from a California company arrived in perfect condition and is exactly the right size for the small downstairs bathroom. But now it's time to buy mirrors for the upstairs bathrooms. A choice I thought would be simple turned out to be almost impossible. Thank goodness my sister, the real Candace Carson, came to visit this week. She helped me measure the spaces where the mirrors need to go and we decided what size and shape would work best. I'd already gone cross-eyed looking at pictures of mirrors. Here are the spaces I needed to fill in the master. My husband's vanity is the smaller one. 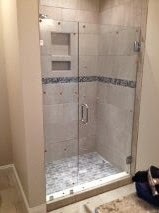 And I've included pics of both showers so you can get a feel for the spaces. and for the guest bathroom I chose a plainer version. 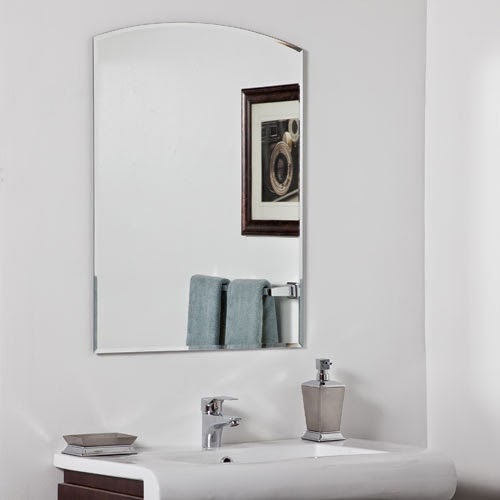 I was so surprised I ended up with the mirrors that were curved on top since most everything else is very vertical and horizontal in the house, but when I picture these mirrors in those bathrooms, they just seem perfect. Let's hope my luck holds and they don't arrive in a billion pieces! What do you think? Have I conveyed how excited I am to being so close to a peaceful life on the lake? If not, I am THRILLED! Now you need to go on Pinterest and share all your photos! Plus, you need to get some decorative items for your home that say "Life is Better at the Lake!" Congratulations on getting through all this! I love the mirrors Leann, and I'm so glad that you are getting closer to having your dream become a reality. I adore your kitchen - the lights look great. 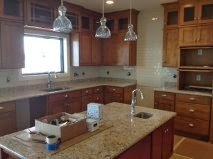 The cabinets are amazing - the glassed areas at the top look wonderful. I like how you have lots of counter space and a great work area in the middle. Can't wait to see pictures of all the finished rooms, once you get moved in. So, take a few deep breaths and tell yourself that you're almost home! I am trying on those deep breaths, that's for sure! That kitchen island was made so I can sit while prepping and area is also big enough to spread out a quilt I might be working on! Thanks Aurian. 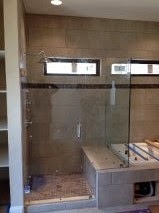 I would say the tile was the most difficult but I was surprised at how hard it was to pick out the mirrors. I thought it would be easy and it wasn't! Leann, I LOVE your choices. Everything is gorgeous. I hear ya about the mirrors, I was getting bleary-eyed looking at catalogues--didn't see anything I liked in the stores--and I was so glad that my husband offered to go online and make the choices. It's a tremendous amount of work putting this all together, but congrats on the almost-finished product. All your hard work paid off! Thanks Mary. It sure has been an interesting journey! I think you made perfect choices. I love how everything is coming together. 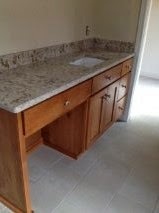 The bathrooms look wonderful, and the kitchen is gorgeous. I have pendant envy--those are stunning. How much longer till you move in? Thanks Heather. Those pendants are my favorite light fixtures! And they cast this gorgeous spotted shadow on the ceiling when turned on. How long? Who knows? The grading of a sloped lake lot is a lot more complicated than we thought, so right now we just pray every day for good weather. :-) Not much left to do inside. A little painting, a few door handles and that's about it! That's awesome. Can you start moving stuff from storage in while waiting for the landscaping? I'm so happy that you're closer to the end of this process. Love the mirrors. Yes. But the front is such a mess that it will have to be things like boxes of clothes, etc. We also do not have garage doors yet--cannot do that without a driveway--so we can't t put things in the garage. And we don't know what we can have in there because there has to be an inspection before move in by the city. The devil is in the details! Thanks Dru! I am feeling the weight beginning to lift. I moved on to choosing window shades and that's not so easy, either! Sounds heavenly!! Hopefully you'll be in there soon and just enjoying it. Your new home will be absolutely beautiful. I love everything you have chosen so far. it won't be long now I would think. Thanks Diane! I sure hope you're right and it won't be long! It is so calm and beautiful by the lake! When we redid a bathroom we looked in all the stores and couldn't find anything remotely resembling what I had my heart set on. So I bought the lights online and we have been very pleased with them. As for mirrors, I wanted two framed ones so we bought picture frames and had a glass company put in mirrors. Perfect. Your house looks lovely. Thanks Barbara. I know what you mean about what you have in mind. It's frustrating when you just cannot find it! I am so grateful for online shopping and also for how quickly things have been sent and with such careful packaging! Love everything you've done! You have great tastes. 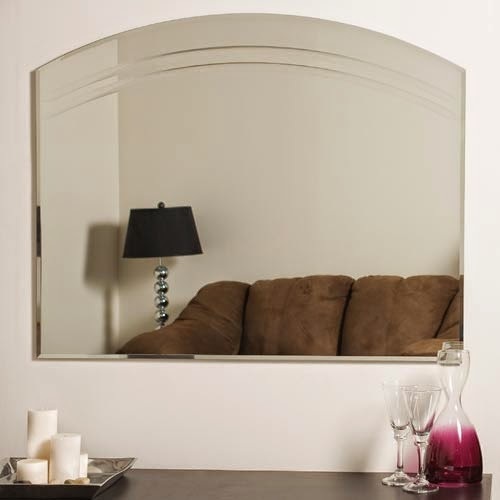 For mirrors I've used antique ones to accent walls around the house. Mixing styles is common now so don't be afraid to add something you like but might be doubtful that "it doesn't go." I love your house, Leann! It looks very serene as well as elegant and stylish. You certainly deserve to be able to relax in your beautiful home. The curve topped mirrors look terrific. Thanks MJ! I am SO anxious to move.